The introduction of the 2.7 litre twin-turbo Diesel to the XJ range marks a significant development for Jaguar’s flagship model. Following on from the highly successful introduction of diesel engines to the X-TYPE and S-TYPE model ranges, the new XJ 2.7 twin-turbo Diesel means Jaguar now offers a diesel alternative across its entire saloon range, ensuring that the marque can meet the increasing demand for diesel-engined cars in the European marketplace. And of course, the 3.0 V6 and three V8 petrol engines – 3.5, 4.2 and 4.2 litre supercharged – remain as impressive as ever. The XJ already ranks as the most technologically accomplished Jaguar has ever built. It is the first production Jaguar to be constructed with a lightweight aluminium monocoque structure; a unique feature that gives the XJ significant competitive advantages over its rivals. A lighter car means faster acceleration and shorter stopping distances, as well as frugal fuel economy and range, particularly when combined with the latest fuel-efficient diesel engine. The aluminium monocoque design of the XJ offers improved stiffness and safety performance over the conventional steel body of the previous model, meaning the customer not only benefits from the weight saving associated with aluminium, but gets the added benefit of exceptional ride and handling as well as being extremely quiet and safe. That’s why the addition of the 2.7 twin-turbo Diesel to the XJ range complements the underlying package so well. Lightweight aluminium construction allied with a modern twin-turbo diesel produces dynamic performance with precise handling and exceptional refinement. Producing 207PS (152kW) EEC a diesel-powered XJ saloon will accelerate to 60mph in just 7.8 seconds, while a powerful wave of torque (435Nm) is available virtually throughout the powerband to ensure instantaneous acceleration in every gear. Yet the efficient diesel engine and light overall weight of the car means low running costs thanks to an average fuel consumption figure of 35mpg (8.1l/100km) combined cycle. With the addition of a Catalysed Diesel Particulate Filter (CDPF), the advanced design of the V6 engine ensures it also exceeds Euro Stage IV emissions requirements. A host of intelligent technology works in harmony with the driver and passengers to ensure perfect ride comfort on every journey. For example, electronically controlled, self-levelling air suspension is standard on all models. This automatically lowers the car at speed to provide remarkable high-speed stability and improve aerodynamic efficiency. Jaguar’s renowned Computer Active Technology Suspension (CATS) uses computer technology and sensor feedback to automatically adjust damper settings. The result is a unique combination of agile handling, outstanding ride comfort and excellent driver control. Noise intrusion into the cabin is reduced to a remarkably low level with the Integrated Acoustic Damping System. This uses high acoustic absorption on the underside of the bonnet, airtight seals between the bonnet and engine compartment and a new double-skin bulkhead structure to dramatically reduce engine noise inside the cabin. For the first time on all XJ models, acoustic laminated glass further minimises the intrusion of external noise into the cabin. The 2.7 twin-turbo Diesel XJ also sets an industry first, being the first car in its class to feature electronically controlled active engine mounts, which cancel 90% of engine vibration at idle. The result is a car that offers best-in-class refinement. The 2006 XJ range also features a host of new features that are included as standard on all models. Subtle changes to the exterior trim of the car give it an even more contemporary feel while a range of driver aids such as the Tyre Pressure Monitoring System, Automatic Speed Limiter and Bluetooth ® wireless connectivity make for an even safer and more relaxed environment. Jaguar has achieved remarkable success in the JD Power and Associates Initial Quality Study released in May in the US. Improving to second place overall, Jaguar topped the poll as the highest-ranked European nameplate. Jaguar's Halewood plant, where the X-TYPE is manufactured, also received JD Power's Gold Award for European plant performance. KEY FEATURES • New 2.7 litre twin-turbo V6 Diesel introduced to XJ range - the first diesel XJ. • Latest twin-turbo commonrail diesel engine technology means the 2.7 litre V6 produces 207PS (152kW) EEC and 435Nm of torque. • Fitted with a Catalysed Diesel Particulate Filter (CDPF). • Accelerates from 0-60mph in 7.8 seconds, with a top speed of 141mph (225kph), yet returns 35mpg (combined cycle). • Electronically controlled active engine mounts on diesel model – an industry first – cancel engine idle vibration by 90 percent and provide class-leading levels of refinement. • Subtle revision to the XJ’s exterior appearance thanks to removal of front and rear screen finishers and body side mouldings. • Even better refinement for all XJ models with the introduction of acoustic laminated glass, a new secondary bulkhead system, isolated driver’s airbag and modifications to the bonnet sealing system. • Bluetooth ® wireless system is available where license permits, allowing drivers to use a compatible mobile phone in a safe, legal and convenient manner. • Uprated braking system with a bigger disc and calliper assembly. • Tyre Pressure Monitoring System (TPMS) to highlight an excessive loss in vehicle tyre pressure. • Two new alloy wheels are introduced: The 19-inch Sabre Wheel replaces the 19-inch Performance wheel on XJR models. An 18-inch Tucana Wheel replaces the 18-inch Dynamic in UK, Europe, North America and the 18-inch Luxury Wheel in other markets on the XJ6 and XJ8 (dependent on market). • Two new exterior colours - Winter Gold and Indigo. Coinciding with the introduction of the new diesel-powered XJ are a host of additional improvements to 2006 Model Year Jaguar XJ models. Widely regarded as being the most refined premium saloon on sale today, significant advances to all new XJs will ensure that the car retains that position. Jaguar is the first manufacturer in the premium vehicle sector to introduce acoustic laminated glass. This glass reduces wind noise and engine noise levels by up to 5 decibels above standard laminated glass. Jaguar is also the first manufacturer to feature a bonnet liner with integrated side seals which further improve noise levels in the cabin. Similarly, the driver’s airbag is now isolated from the steering wheel, which significantly reduces the level of vibration transmitted through to the driver. As well as ensuring Jaguar customers own one of the most refined cars in the world, the addition of several new technology features to all models (dependent on market) guarantees they also own one of the safest. All XJs are fitted as standard with 19 and 20-inch wheels and - dependent on market - use Jaguar’s Tyre Pressure Monitoring System (TPMS) which assists the driver by highlighting an excessive loss in vehicle tyre pressure. TPMS measures the pressure in each of the tyres on the vehicle and issues warnings if any of the pressures deviate to a significant level. An Automatic Speed Limiter (ASL) feature can be used by the driver to select a maximum vehicle speed limit. This is an additional function which is incorporated into the current cruise control system. When the ASL has been set, the throttle will respond to the driver’s demand until the set limit is reached. At this point, provided the throttle position is sustained, the vehicle will maintain the set speed. The ASL system can be cancelled by either switching to cruise control, applying kick-down on the accelerator pedal or by pushing the cancel button. ASL is used separately rather than together with the Adaptive Cruise Control (ACC) system. Aware that safe and legal mobile phone usage is vital to nearly all our customers, Jaguar introduced Bluetooth ® connectivity to the XJ as an optional feature in the 2005 Model Year (where license permits), replacing the previous fixed phone solution. The system has been developed by Jaguar in conjunction with Motorola and is compatible with a number of current Bluetooth ® handsets (depending on market). The main benefit of the Bluetooth ® integration feature is the flexibility and simplicity it offers, providing primary phone functions while interacting with on-board vehicle controls such as steering wheel buttons, the audio system, touch-screen and JaguarVoice control (where fitted). The phone can be left in the driver's bag or pocket and does not need to be docked into the vehicle. Calls can be actioned by using the steering wheel controls and audio or touch-screen keypads. The audio will be muted and the dedicated microphone, carried over from previous systems, switched on. Voice commands can be used where the optional JaguarVoice system is fitted. The combination of a modern turbodiesel engine and the highly advanced aluminium body of the XJ range delivers an exceptional package of performance, dynamics, refinement and economy. All the advantages of modern diesel engines – fuel efficiency, relaxed motoring and impressive power delivery – are only amplified by linking them to a super-strong and lightweight chassis, like that of the XJ. Launched in Jaguar’s mid-range S-TYPE saloon in 2004, Jaguar’s state-of-the-art twin-turbo V6 Diesel sets new standards in refinement and performance. The highly efficient 24-valve engine features advanced technologies, including the latest generation high-pressure, commonrail, direct-injection fuel system and a lightweight, compacted graphite iron (CGI) cylinder block. The outstanding strength and durability of CGI means that less material is needed than for a conventional cast iron block, ensuring reduced engine weight and length. In fact, the new diesel engine is the lightest unit of its type, at just 202kg. This significantly contributes to the excellent power-to-weight ratio and fuel economy. Other features at the heart of the engine provide the capability to deliver high performance and excellent durability. Cast aluminium pistons incorporate ‘double wave-gallery’ cooling. In this process, oil is sprayed precisely onto the inside of the pistons from jets in the block. The oil then flows through two internal wave-shaped channels to help cool each piston crown. This arrangement also has the indirect benefit of reducing piston ‘slap’ noise. Management of the engine’s noise characteristics has focused particularly on injector tick and combustion noise, which is controlled through the use of next-generation commonrail technology, including ‘multiple-point’ injection and closed-loop injection control, which ensure that the combustion is smooth under all operating conditions. The fuel quantity provided by each injector is controlled by a Piezo actuator, which enables highly accurate fuel metering of up to five injections per cycle. These features provide an extremely fine spray of diesel fuel, which ensures the most uniform fuel-air mixture possible, resulting in a more complete combustion process. As a result, the diesel engine is able to achieve both high power and the desired emissions capability. From the outset, the 2.7 twin-turbo Diesel engine was designed to meet future emissions levels. However, further advances in reducing emissions since the launch of the S-TYPE twin-turbo Diesel have been made through changes to the fuel injection system, utilising higher injection pressures and different injector spray patterns. The calibration of the electronically actuated turbochargers, the exhaust gas recirculation system and port deactivation have also been revised. With the addition of a Catalysed Diesel Particulate Filter (CDPF), the advanced design of the V6 engine ensures it exceeds Euro Stage IV emissions requirements. Aiding both performance and emissions is a forced induction system, comprising twin-turbochargers with state-of-the-art electronic actuation. Traditionally, turbochargers are vacuum actuated, but this new form of rotary electric actuator gives a higher degree of control, providing benefits in the areas of emissions and transient engine performance, as well as in balancing performance and emissions between the two cylinder banks. The turbochargers are a low inertia type for quick, responsive, power delivery. The high-grade aluminium alloy cylinder heads are equipped with four valves per cylinder and double overhead camshafts. This combination provides optimum induction and exhaust actuation, with attendant benefits in performance and emissions. The cylinder head design includes a port deactivation system and pistons with toroidal combustion chambers, producing a highly efficient combustion capability. A low - by diesel standards - compression ratio of 17.3:1 contributes to improved emissions quality, quieter combustion and compatibility with the engine’s unique forced induction system. In a diesel engine, reduced compression means less heat build-up in the piston bowl and more efficient fuel burn, resulting in lower levels of pollutants. A revised secondary bulkhead structure has been introduced to the engine compartment of all XJ models – both diesel and petrol – to reduce interior noise levels by up to 5 decibels. 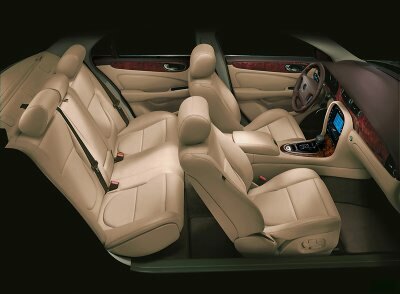 The result is the most refined vehicle in its class for interior comfort. The XJ Diesel is also the quietest vehicle in its class for exterior noise, with the noise level measured by the Vehicle Cerification Agency being 7 decibels (A) lower than the EU legal limit for diesel vehicles. In order to achieve this, the exterior noise package has been significantly enhanced. 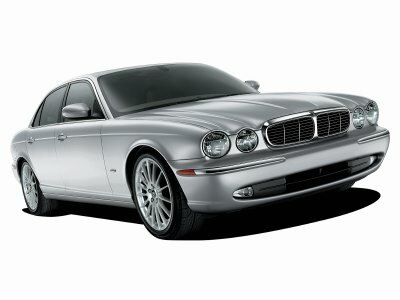 The XJ 2.7 litre twin-turbo Diesel is best-in-class for isolation from engine idle vibration. This is achieved with active engine mounts, which are introduced on all 2006MY XJ Diesels and are an industry first. The engine mounts were designed and developed in conjunction with Avon Automotive. Diesel engines generate much greater levels of vibration than their petrol equivalents, which is why the mounts are being fitted to the XJ Diesel variants. Active mounts use an electronic control system and a powered mechanism to cancel an additional 90 percent of this engine vibration at idle. A system that can cancel out in excess of 90 percent of engine idle vibration into the car has a huge impact on the vibration levels experienced by the vehicle occupants. This technology, in conjunction with the other noise, vibration and harshness (NVH) improvements, ensure that Jaguar delivers class-leading levels of refinement for the XJ's first ever diesel engine. 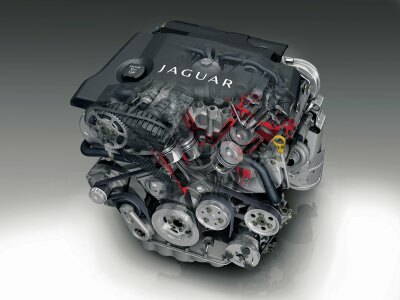 During the development of the XJ 2.7 twin-turbo Diesel, Jaguar’s engineering team worked closely with our Customer Service Organisation to deliver excellent cost of ownership figures. The diesel-powered XJ benefits from an increased standard mileage service interval over the petrol models resulting in an approximate saving of 7 percent in routine maintenance costs over five years. Against diesel competition - in the shape of the Mercedes S320 Cdi - the cost of routine maintenance is forecast to be an impressive 27 percent less for the XJ Diesel. Similarly, wear and tear index costs compared with the Audi A8 3.0 Tdi and Mercedes S320 CDi are forecast to be 25 and 28 percent lower respectively.